Everywhere now — over the whole earth? All this in the service of Durrell’s Alexandria Quartet, noting the fact that not even a Roman autocrat could escape his fate. Bear with me — I think about stuff like this when I’m out walking late at night and the stars are particularly stunning. Before my walk, I had been looking at images of M31, the Andromeda galaxy, and doing my usual “What would it be like to be there” routine. Minus Durrell/Cavafy’s dark vision, I might still ask myself what had changed. From a vantage in the Andromeda galaxy, there would be a Milky Way in my sky. And what else? Then David Herne dropped me a note, providing a link to new research from Australia’s International Centre for Radio Astronomy Research dealing with this very galaxy. The work described therein raised the question anew: Just how alike are Andromeda and the Milky Way? For some previous estimates have held that M31 was actually two to three times the size of our galaxy, while others have found a rough parity, with Harvard’s Mark Reid and colleagues arguing in 2009 that our galaxy is about as massive as Andromeda, with a mass of up to 3 trillion Suns. Image: The Andromeda Galaxy, perhaps a twin of our own. We can see Andromeda from without, but determining the structure of the galaxy we move through ourselves is a continuing challenge. Credit: NASA. Does that mean that the Milky Way contains three trillion stars? Absolutely not. I’m seeing the three trillion star number popping up all over the Internet, and almost reported it that way here when I first encountered the work. The misunderstanding comes from making mistaken assumptions about galactic mass. Reid used the Very Long Baseline Array to examine regions of intense star formation across the galaxy, a study the scientist reported at the American Astronomical Society’s winter meeting this past January . The Milky Way does indeed turn out to have much more mass than earlier studies had indicated. But a heavier than expected Milky Way means — according to much current thinking — a larger amount of dark matter. Reid and team had found that the Milky Way was rotating 15% faster than previously assumed, matching the rotation rate of M31 and implying similar overall mass and size. But only a fraction of this would be normal matter, so that a mass of three trillion Suns would still translate to, say, five hundred billion actual stars, and they would be spread over all stellar classes. In any case, the 3 trillion figure is now in doubt. Back to the ICRAR work. In 2014, Prajwal Kafle (University of Western Australia) revised back downward the mass of the Milky Way, studying the kinematics of halo stars to determine the underlying distribution of mass, revealing about half as much dark matter as had been previously thought. 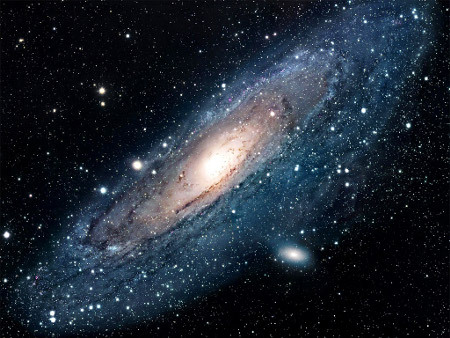 Now Kafle and colleagues have gone to work on Andromeda, reaching the conclusion that the galaxy is about 800 billion times heavier than the Sun. Our nearest galactic neighbor thus turns out to be roughly the same mass as the Milky Way. As in their earlier study, Kafle’s group looked at the orbits of high-velocity stars as a way of gauging galactic escape velocity, a technique developed by British astronomer James Jeans in 1915. For the Milky Way, this value is thought to be in the neighborhood of 550 kilometers per second, a figure Kafle and team confirmed in 2014. The new paper’s data mean that the value for Andromeda is not dissimilar. Like the Milky Way, M31 turns out to have much less dark matter than previously thought, perhaps only a third of earlier high-end estimates. We have five billion years to wait before the merger of our two galaxies, which happens to be the same timescale that takes in the growth of our Sun to red giant stage. What will the Solar System become as the Sun swells and the galaxies begin their close encounter? Kafle’s simulations of the event are spectacular, as you can see below. The paper is Kafle et al., “The Need for Speed: Escape velocity and dynamical mass measurements of the Andromeda galaxy,” Monthly Notices of the Royal Astronomical Society February 15th, 2018 (abstract). Kafle’s 2014 paper on the Milky Way’s mass is “On the Shoulders of Giants: Properties of the Stellar Halo and the Milky Way Mass Distribution,” Astrophysical Journal 794, No. 1 (24 September 2014). Abstract. Durrell’s Alexandria Quartet is one of my all-time favourite books. So I won’t be surprised if next you quote from Peake’s Gormenghast trilogy! Apparently the galaxies miss each other upon first encounter, but the subsequent merge looks to be a bulls-eye. Oddly, the two supermassive black holes do not seem to immediately merge, but have to wait for subsequent bounces. It is heart-warming to see my home town, Leicester, in the video credits, from the astrophysics department of the university. If I can find a Peake hook, I will certainly quote from Gormenghast. Wonderful books! Presumably, a lot more interesting things happen in the collision. Oort clouds must be disrupted, resulting in bombardments on the local systems, possibly increasing extinctions. If panspermia happens, then gravitational effects would increase “mixing” and target impacts, spreading life. Some stars must collide too. The black holes at the center of galaxies have got to be rather devastating as they plow through star fields. Then there appears to be a lot of star formation (in the simulation) too, resetting life’s genesis throughout each galaxy. Would highly advanced ETIs be helpless to do anything, or might they influence events on even the largest scales, perhaps even piloting a galaxy to avoid such collisions? That we see such collisions in the universe suggests that is not a widely attempted action, with whatever that implies about ETI. Can you imagine the diplomatic nightmare if both galaxies hosted Type 3 civilizations? Perhaps the adverse effects of merging could be mitigated on a per star system basis. Targeting the mitigation to protect colonized systems would likely require much less energy. Without some form of FTL communications there won’t be any diplomacy between Type 3 civilizations. Who is going to wait around for thousands of years to get a message acknowledged? Actually, collisions between individual stars would be unlikely in a galaxy merger – the distances between the stars are just too vast. I’m not even sure there will be many more perturbed Oort Clouds than there already is from close encounters with other stars. The supermassive black holes will sink to the centre of mass of the coalescing galaxies, but even then supermassive black holes are tiny in the grand scheme of things – according to Wikipedia, Sagittarius A*, in the centre of the Milky Way Galaxy, is only 44 million kilometres across. The black holes will likely just slip through. While the stars won’t collide, you are correct though that giant molecular clouds can’t avoid each other and will collide, leading to almighty starbursts. With enhanced star formation comes an enhanced supernova rate, which could have negative consequences for habitability across large swathes of the galaxy. However, simulations suggest that the Sun will be perturbed and ejected into the halo of the new elliptical galaxy that forms. The Sun will be nearing the end of its life by then so there may be no life left in the Solar System, but other, younger stars near the Sun may also be kicked to the outskirts of the galaxy, far enough away from the fires of supernovae and star formation. The galaxy collision may even be to the advantage of advanced civilisations, if they are using the supermassive black hole as an energy source, doubling the black hole’s mass might be something they’d want to do – a merged black hole would possibly increase its spin rate, increasing the amount of rotational energy that can be extracted, and the stronger gravitational field will only serve to make any accretion disc even more intense, from which energy is released as radiation. Maybe we should be looking at merging black holes on the off-chance that someone is manipulating the mergers, and perhaps some Dysonian SETI can be done with gravitational wave detectors. So, far from advanced civilisations wanting to avoid galaxy mergers, they may be wanting them to happen! ETI wanting galaxy mergers. Intriguing idea. A cosmic version of corporate mergers. gravity to draw most of the unbounded hydrogen gas clouds much closer to the center and compacting them to inducing an long pulse of star formation. arms. To use human anatomy: Long and graceful turns to chunky. If our descendants keep descending that long we can hope they’d be able to protect their home(s) from oortish objects and maybe move them far enough to avoid expanding suns. Those in more easily portable habitats should be fine and would probably find new kinds of opportunities. Of course there would be thousands or more years of passing very alien star systems with the chance of meeting Andromedans of one stripe or another. Exciting times, but first we have to get past global warming. The dark matter hypothesis has yet to be proven. Consequently, M31 might really have a mass of three trillions suns. Just when we are starting to think we know just about everything about the formation of spiral galaxies, ALONG COMES THIS: “Is the Spiral Galaxy a Cosmic Hurricane?”, by Zexin Cau, Ling Liu, Timting Zheng. Very interesting article and site. However other studies show Andromeda to be twice as massive as ours in terms of stellar mass (what can be seen unlike dark matter), and twice as large. Not that it changes very much the fate of both her and our galaxy. Galaxies are not static islands of stars – they are dynamic and ever-changing, constantly on the move through the darkness of the Universe. Sometimes, as seen in this spectacular Hubble image of Arp 256, galaxies can collide in a crash of cosmic proportions. Are April Fools Day “scientific papers” out EARLY this year? Astronomers claim to have discovered a dwarf galaxy WITH ABSOLUTELY NO DARK MATTER IN IT, and; this PROVES BEYOND A REASONABLE DOUBT that dark matter DOES exist!